Based on the financials extracted from its quarterly reports in Chart 2, its profits margins seem commendable. Despite a dip in profit margins in Q1 2018 compared to Q4 2017, it managed to record a profit after tax margin of 15%. Its immediate past 5 quarters compounded annual growth rate (CAGR) for its profit before and after tax margins have been around 10%, while for revenue, its CAGR was lower at 3.3%. This shows that the company is becoming more efficient despite slower top-line growth. From our assessment of its business segments, it is evident that its Landscaping & Infrastructure segment has been growing at a CAGR of 10.5%. Despite recording a significant CAGR in its Maintenance segment of 29.2%, its revenue growth has been relatively stagnant over the past 4 quarters. With a gearing ratio of about 111%, it is worth noting that its total debts slightly exceeds its net assets. It has been taking on debt to finance the acquisition of intangible assets, namely a Concession Agreement with the Solid Waste and Public Cleaning Management Corporation and the Government of Malaysia, represented by the Ministry of Housing and Local Government. The Government awarded its subsidiary, Cypark Smart Technology, the rights to undertake the design, construction, maintenance, operation and management of Solid Waste Modular Advanced Recovery and Treatment Systems incorporating Waste-to-Energy systems at Ladang Tanah Merah, Negri Sembilan under Build-Operate-Manage-Transfer concept for a period of 25 years, subject to the terms and conditions of the Concession Agreement. 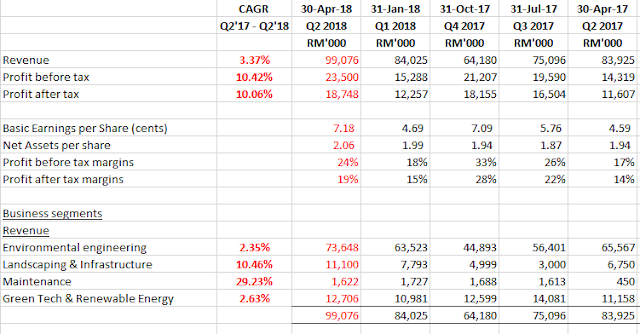 Due to this acquisition, its debt levels seem to be on the high side, but it should be manageable considering Cypark's ability to generate decent profits every quarter. Overall, its profit and loss statement seems healthy as it commands profit margins above 15%. One of major areas of concern is its high gearing ratio of 111%. In my opinion, investors need not be overly concerned about its financials. Cypark has been consolidating ever since it reached its peak of RM2.76 in May 2017, and is seen forming a descending triangle. Immediate support is pegged at RM2.30, while resistance is represented by the downward sloping trendline. A bullish move towards RM2.50 would be a clear indication of its intention to change trend. However, momentum indicators and volume do not indicate strong bullish momentum at this juncture. It should be noted that while the FBMKLCI is in a confirmed downtrend, this stock only retraced by 15% from its peak of RM2.76 to RM2.40 on July 13, 2018. This is an indication of the defensive nature of this stock. See Chart 4: Cypark Price Chart below. 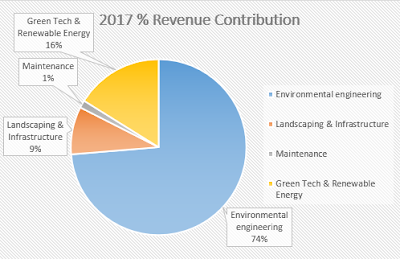 For its Renewable Energy segment, in its recent quarterly announcement Cypark expects its total renewable energy plant capacity to jump fourfold to more than 120 MW by 2020. In addition, the company anticipates that RM80 million would be generated annually over a 25-year concession period from its Ladang Tanah Merah biogas-to-energy project upon the commissioning of its Fully Anaerobic Bioreactor System (FABIOS). It is also expected that its new large-scale solar project win would contribute positively to its earnings. For its Green Technology segment, it intends to export its Biomass Green Pellet made from empty fruit bunches (EFB) to selected regional markets. Additionally, an opportunity to develop a Net Energy Metering (NEM) Project was offered by the Sustainable Energy Development Authority of Malaysia (SEDA). Cypark's business model seems to be sustainable and less susceptible to external market forces. However, it is reliant on projects from the government. Investors need not worry about the profitability of Cypark as its profitability appears sustainable. Its share price is consolidating with low volume at this moment. While it is neither a bullish or bearish indication, a strong move followed by heavy volume would be a strong indication of the direction of its next trend. In conclusion, I view Cypark as a defensive stock due to the points discussed above and could be a good investment in a weak market. Considering that the FBMKLCI is already in a confirmed downtrend, this stock only retraced by 15% from its highest point of RM2.76 in May 2017.